We are proud of our quality and our stock and try to describe each item as fully as possible to help you to make an informed decision before your purchase. We aim for 100% satisfaction amongst our customers. We want you to come back and encourage your friends to buy from us. If you need any assistance with any item or have any problems with anything purchased from the TAF Music Gift shop, we would be happy to help. Please use the contact form on the website as a first point of contact. Due to variations in computer monitors, colours shown on the screen may not match the colour of the item exactly. As many of the items are hand crafted, the design may vary slightly from the illustrations. We recommend that personal items such as earrings should be cleaned before use to eliminate the slight possibility of contamination that may be picked up in manufacture, storage, packaging or transit. TAF Music Gifts will accept no responsibility for any problem arising from the buyer not following this instruction. Items placed into your trolley will be reserved for you for 2 hours to allow you to complete your purchase. A trolley that has not had anything added for 2 hours will be treated as abandoned and all items will be removed automatically and returned to the publicly available stock. Prices (and discounted prices) for individual items are valid as displayed on the site and while in the trolley (once an item is in your trolley we will not change the price to you). 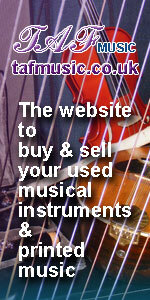 TAF Music Gifts may change the prices or remove any discount on any publicly available item at any time. The total price for items in your trolley plus postage and handling for shipping to your location is shown in the "Your Trolley" box on the top right of each product page of the site. Orders will not be processed until full payment has been received through our PayPal checkout. Just like a physical shop, we don't require you to register to buy from this site. Your purchases will be shipped to the address that is provided to us by PayPal following your payment. We use PayPal for our payment system as PayPal will not give us any of your bank or card details - so we don't have to worry about loosing them or someone stealing them from us! We try to keep your postage costs as low as possible and charge postage at cost (based on Royal Mail Large Letter or Packet rate as appropriate) plus a small packing and handling charge. Larger packets may be sent by Courier where this is a lower-cost alternative. The maximum we currently charge for postage is £5.00 for deliveries to Britain - delivery costs are always displayed in the Trolley summary on each page of the website and on the checkout / trolley page. All items sent through Royal Mail will be posted with proof of posting, courier shipped items may be trackable depending on the service used. If the value of your purchase is over £40, we may, at our discretion, upgrade the delivery to use a service that requires a signature such as Royal Mail Special Delivery. If no one would be available to sign for the package and you would rather receive the package by ordinary mail, please mention this in your PayPal checkout Message to Seller. We aim to dispatch items within 2 working days of receipt of payment. We have no control over the item once it is posted so please allow at least seven days before contacting us to report an item that has not been received. All items sold by TAF Music Gifts are new and unused. In line with our environmental policy, we reserve the right to post the items using recycled postal packaging. Please refer to our return policy page for details on returning purchased items. Buyers outside Great Britain do not have the option to return a product once bought unless it is faulty. Shipments outside Great Britain will incur additional postage and packing costs to reflect the actual cost of postage plus the extra work involved in overseas postage. Please contact us for a postage adjustment prior to ordering. All overseas shipments will be sent through Royal Mail Airmail Small Packet service and will be probably be delivered through the local postal service. Delivery times vary from country to country. Any taxes charged or duties incurred by the buyer in receiving an item from Great Britain are the sole responsibility of the buyer. Items that are shipped to overseas buyers will be declared at the full retail value for customs purposes. The design of all items sold through the Taf Music Gifts website are the intellectual property of the designers and/or copyright holders and no design may be reproduced without legal permission from the copyright holder. All images and text on the Taf Music Gifts website are copyright and may not be downloaded, saved, modified or otherwise reproduced without express permission from the management of Taf Music Gifts. TAF Music Gifts Terms and Conditions will be governed by and interpreted in accordance with English Law and the courts of England and Wales have jurisdiction to resolve any disputes.